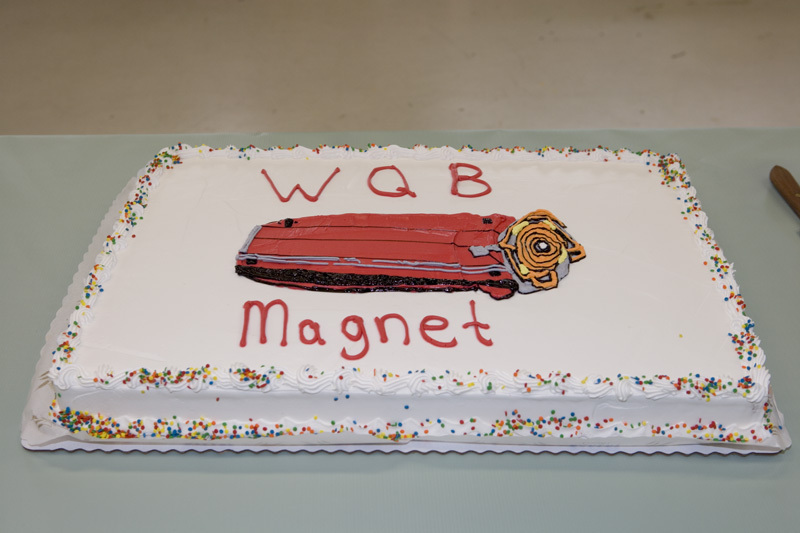 From the start of the Main Injector project, we recognized that at the injection and extraction points the old Main Ring quadrupole magnets would eventually be a limit to the aperture, and thus to the amount of beam that could be handled. Proton Driver design studies in 2000 and 2002 led to a conceptual design by Vladimir Kashikhin. As the NuMI turn-on approached, the issue of increased intensity in the Main Injector became more of an issue. In addition to increasing the intensity, the NuMI installation also added another extraction point, and the SY120 program further complicated operations. So, in February 2004 we kicked off the WQB project with a review of the conceptual design. Emittance preservation: Beam at the end of the main linac. After the use of a simple correction method, particles of different energies have a clear spread in vertical position (top). This is corrected better with an advanced correction method (middle). With an advanced correction and additional global optimization the result is very good (bottom). Obtaining high-luminosity beams will be crucial for the future International Linear Collider. An important indication on the beam quality is given by the emittance, which depends on its size and opening angle. The lower the emittance, the easier it is to focus the beam and the more particle collisions can occur and be analyzed. In the GDE the "Accelerator physics" group, a special team dedicated to the technical systems organized at CERN, on 08-11 February 2006, a "Low Emittance Transport Workshop". About 30 accelerator scientists, coming from all regions, attended it. Quantum chromodynamics, the theory of the strong nuclear force, is notoriously intractable. An alternative approach brings gravity to bear, and produces fairly accurate predictions of some physical quantities. The strong nuclear force is the force that causes quarks to bind together to form composite particles, such as the proton. It is explained within the standard model of particle physics by a theory known as quantum chromodynamics (QCD) in terms of fields analogous to electric fields that arise between particles that possess 'colour' charge � the strong-force equivalent of electric charge. Unfortunately for the theorists, however, QCD has consistently eluded analytical solution. The best available calculations rely on huge supercomputer simulations, and the parameters that emerge must be fitted to experimental results. What happens when you hurl pions, kaons, protons and antiprotons against a stationary target? The answers are pouring in as the Main Injector Particle Production Experiment completes its first year-long run. MIPP bombards fixed targets with a variety of particle beams and carefully records the resulting collisions in order to shed light on the dynamics of particle production. "It's kind of the bread-and-butter measurement of any collider experiment," said Holger Meyer, MIPP run coordinator. "Other experiments can use our measurements to understand their own data better." 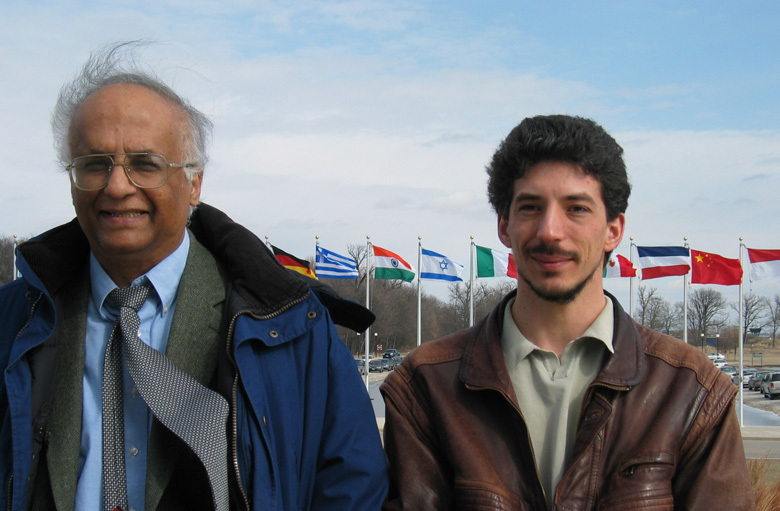 But MIPP also does its own physics: spokesperson Rajendran Raja says that studying all these collisions in such detail helps elucidate very general scaling relations for inclusive cross sections, which are fundamental to understanding non-perturbative Quantum Chromodynamics. QCD is the theory that describes strong interactions, the intense attraction between the quarks and gluons that fly out from hadronic collisions. "Strong interactions are everywhere," said Raja. "Physicists really don't understand them." Raja also explained how MIPP's measurements will help researchers understand particle interactions in a number of other experiments. "Our data will be immediately useful for the MINOS experiment because neutrinos are produced by pions and kaons off the NuMI target and those cross sections are not known well," he said. In addition to understanding neutrino production, Raja says that MIPP data could be useful to CDF, DZero, CMS, ATLAS, and cosmic ray experiments in order to understand hadronic showers in their calorimeters. So far, MIPP has data from about 27 million events, but Raja says it has to go much farther to be really useful, and that can be done with a simple upgrade. "If we can take data 100 times faster then we'll solve the hadronic shower problem once and for all." He said. "We'll completely satisfy a broad range of needs." Tickets for the Graduate Student Association's first Formal Winter Ball, to be held on Sat., Feb. 25, 8 p.m., go on sale today. Cost to attend the ball is $5 per person and all are welcome. For more information, please visit the Web site. To purchase tickets, please contact GSA representatives Leah Welty-Rieger, x3853 or lwelty@fnal.gov, or Tuula Maki, x8414 or tmaki@fnal.gov. If you would like to take part in the Fermilab Technical Publications survey, you can access it online. All Fermilab members are welcome to participate. Effective Monday, February 27, the employee assistance program will be suspended. This will continue until an outsource firm is selected to provided these services in the future. Family and Medical leave information will be available from Scott Lindsey in the Benefits office, at x 4362. Information about Wellness Works will be available from Jean Guyer in Recreation at x2548. A memorial service for Jane Wilson will be held at Kendal at Ithaca on Saturday, March 11. The time is tentatively mid-afternoon; please contact jackiec@fnal.gov if you would like to be notified when confirmed. As mentioned previously, burial at Fermilab will be at a later date.